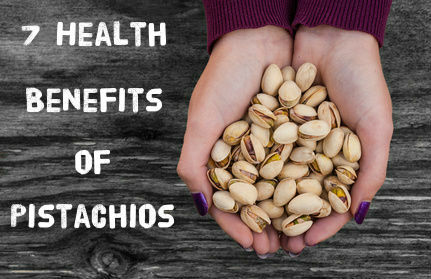 7 Health Benefits of Pistachios | Eat This! Originally from Western Asia, but known for thousands of years throughout the Mediterranean, the pistachio has been cultivated commercially in the English speaking world in Australia, New Mexico and in California where it was introduced in 1854 as a garden tree. The pistachio is one of two nuts mentioned in the Bible and these days another delicious, nutritious nut to snack on and benefit from. Here are seven health benefits of pistachios that may make you want to include them in your diet on a regular basis. Pistachios have been shown to reduce LDL (“bad”) cholesterol and increase the good HDL cholesterol after only a short period of regular consumption. High in antioxidants such as vitamins A and E, they fight inflammation, protecting blood vessels and reducing risk of heart disease. Even a moderate intake of pistachios has been shown to increase levels of lutein, an antioxidant well known for protecting against oxidized LDL, reducing heart disease. Eating pistachios may help to prevent Type 2 diabetes. 60 percent of the recommended daily value of the mineral phosphorous is contained in just one cup of pistachios. As well as breaking down proteins into amino acids, phosphorous aids glucose tolerance. Pistachios are an incredibly rich source of vitamin B6. Vitamin B6 is essential to make hemoglobin, the protein responsible for carrying oxygen through the blood stream to cells, and is also shown to increase the amount of oxygen carried. The vitamin B6 so abundant in pistachios has wide-ranging effects on the nervous system. Messaging molecules called amines require amino acids to develop, which in turn rely on vitamin B6 for their creation. Furthermore, B6 plays a crucial role in the formation of myelin, the insulating sheath around nerve ﬁbers that allows optimal messaging between nerves. Furthermore, vitamin B6 contributes to the synthesis of serotonin, melatonin, epinephrine and gamma-aminobutyric acid, or GABA, an amino acid that calms the transmission of nerve impulses throughout the nervous system. Pistachios contain two carotenoids not found in most nuts. These carotenoids, called lutein and zeaxanthin, function as protective antioxidants, defending tissues from damage from free radicals. They have been linked with a decrease in the risk for developing age-related macular degeneration, which is the leading cause of visual impairments and acquired blindness in the United States. A healthy immune system requires adequate intake of vitamin B6, which pistachios abound in. A surfeit of vitamin B6 can retard brain activity as well as decrease the effectiveness of the immune system for fighting infections. Vitamin B6 found in pistachios also helps the body make healthy red blood cells, and helps maintain the health of lymphoid glands, such as the thymus, spleen and lymph nodes, ensuring the production of white blood cells that defend the body from infections. Pistachios are a great source of vitamin E, a powerful fat-soluble antioxidant, essential for maintaining the integrity of cell membranes and often recommended for healthy and beautiful skin. Vitamin E does an excellent job protecting the skin from UV damage, providing daily defense against premature aging and skin cancer. 1 Comment on "7 Health Benefits of Pistachios"
But will I gain weight? They are so good I cannot stop eating.